Redding’s PR-50 volumetric measure provides benchrest-grade consistency with most propellant granule types. Filling your rifle cartridge cases with consistent charges of gunpowder is a cornerstone of building accurate handloads. However, the process of producing those consistent charges can be slow, effort-intensive and aggravating. Precision handloaders address the issue with various methods, using some combination of powder tricklers, mechanical scales, electronic powder chargers and sometimes volumetric measures. The latter is an often misunderstood tool viewed as primarily suitable for high-volume loading where charge consistency isn’t particularly important. However, a premium-quality volumetric measure can provide excellent consistency and has several advantages—namely they’re not affected by moving air or changes in barometric pressure. Volumetric measures are fast, typically capable of throwing a charge every few seconds. However, many—even most—aren’t capable of throwing super-consistent charges, simply because they’re not built with the precision and engineering necessary to do so. Long-grain extruded propellants can cause issues in all powder measuring systems. Tricklers and electronic dispensers suffer from grains stacking or bridging at the dispense tube’s mouth, then collapsing all at once into the pan. Volumetric measures suffer from grains getting caught between rotating edges, which in most measures causes a significant jolt as the handle is rotated and the grains sheared through. Vibration causes settling, and in a volumetric measure, settling causes inconsistent charge weights. But a really good volumetric measure, such as Redding Reloading’s new PR-50 volumetric measure ($326) is capable of producing charge consistency that rivals the best electronic chargers. Redding tailors its volumetric measures to relatively narrow charge-size sweet spots, which enables the company to engineer each model for ultimate consistency when throwing charge weights inside a certain window. The PR-50 is geared for cartridges such as the 6.5 Creedmoor. Redding also sells high-volume, and since all measures use the same diameter hopper, they’re interchangeable. Each drum—the rotating part that contains the metering chamber—is made from U.S.-sourced bar stock steel, on U.S.-made Haas CNC machines. Drums are then centerless ground, which results in a perfectly round part with a high-polish ground finish. A series of plating processes are applied, finishing with a final layer of hard chrome. “The grinding process also creates a very sharp cutting edge on the metering chamber, which is critical to cleanly cutting through long-grain powders,” said Robin Sharpless, Redding’s vice president. Each drum is individually fit into a frame of dense-grain virgin cast iron that’s been Haas CNC-machined, then honed on a Sunnen Hone to .001-inch perfection. With almost no porosity, the fine-grain cast iron has a surface that almost self-lubricates against the chrome. Redding uses a “hemispherical” plunger that features a concave face shaped like a test tube bottom. This prevents long-grain propellants from bridging or stacking. Hoppers feature a baffle that helps keep metering-chamber fill consistent whether the hopper is topped off or nearly empty. Sharpless passed along some tips to improve consistency, advice that is good for pretty much any type of volumetric measure. He said it’s important to do the exact same thing every time you cycle the measure. “If you tap the handle once at the top and twice at the bottom, do that every time,” he said. He also recommends throwing 10 charges after the measure is filled and dumping them back into the original canister. This removes the dense layer packed in the bottom. He also recommends slow, even cuts when throwing charges of long-grain powder. Redding also offers an optional bench stand for mounting measures on a bench. It’s made of aluminum and doesn’t have any square angles, so it deadens vibration—the enemy of precise, consistent volumetric powder measuring. Following Sharpless’s tips for consistency, I ran tests with three different types of propellants, throwing 100 consecutive charges and weighing each on an RCBS M1000 mechanical scale. Throwing 50 grains of H380—a spherical powder suitable for a broad range of cartridges—an astounding 98 fell dead on the money. The other two charges? A tenth-grain shy. That’s superb consistency, although spherical powders are known for consistent metering. IMR’s 8208 XBR—a small-grain stick powder popular among benchresters—also displayed good consistency. Seventy-eight charges were perfectly on, while 22 were a tenth-grain shy. For a long-grain propellant, I tested Hodgdon’s über-popular H4350, which is the go-to for 6.5 Creedmoor. Long-grain powders are challenging to meter, so it wasn’t surprising that consistency wasn’t quite as good as with the other two powders. Fifty-one of the charges were exactly on target, and 36 were only 0.1 grain high. The rest were not that close, but of the 100 charges, 99 varied no more than 0.3 grain from lowest to highest charge weight. I would call this excellent performance from a volumetric measure. 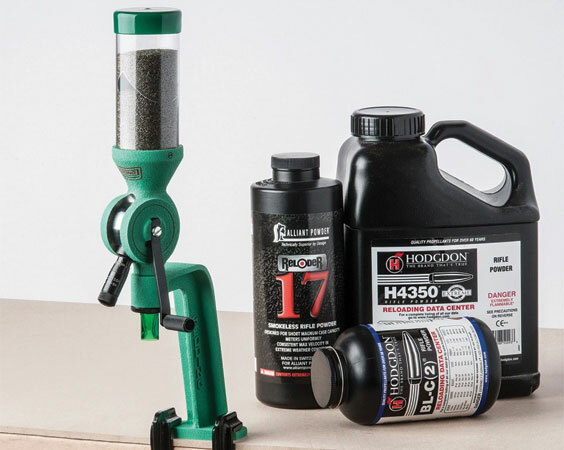 Whether this sort of consistency and convenience matters for your reloading—and whether the expense is worth it—is a decision you have to make.